You can adjust the appearance of bnClock. The Appearance Settings screen is show below. Exit at any time by swiping right or left, or tapping the Done button. You can choose one of three colors for your clock digits. The colors were selected to mimic some traditional clock radio colors. Simply tap on the color of your choice. The clock display may be too bright at night for you. 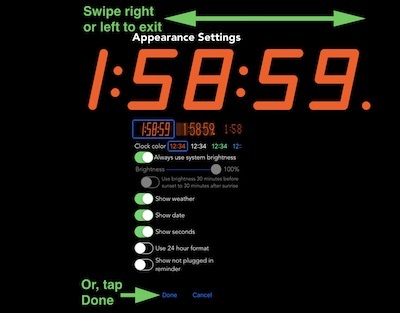 bnClock provides some options for controlling the display brightness. Always use the system defined brightness. Depending upon how you have configured your device, your display may automatically dim when the ambient light decreases. 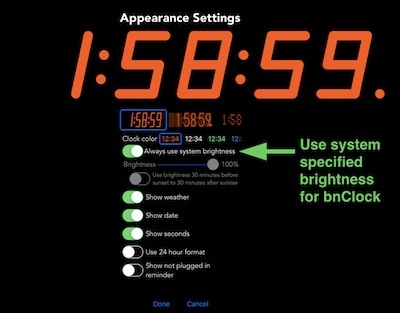 Turn off Always use the system defined brightness to use the bnClock brightness whenever bnClock is displayed. 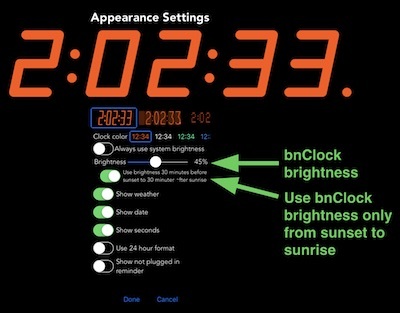 Turn on Use brightness 30 minutes before sunset to 30 minutes after sunrise to use the bnClock brightness from just before sunset to just after sunrise. Otherwise the system brightness will be used. 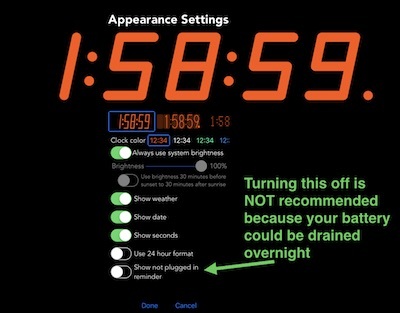 If you have turned off Always use the system defined brightness, you can also adjust the brightness when viewing the clock by dragging up and down on the clock. If you have enabled Use brightness 30 minutes... display brightness will return to the system defined brightness after a few seconds if the time is not between sunset and sunrise. 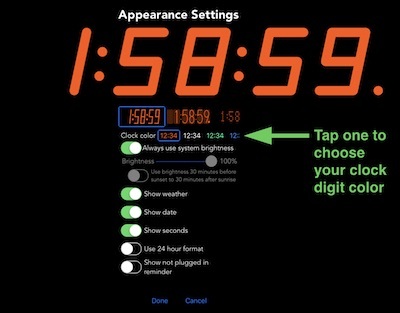 bnClock will restore your device's brightness to the system setting when you switch to another app. 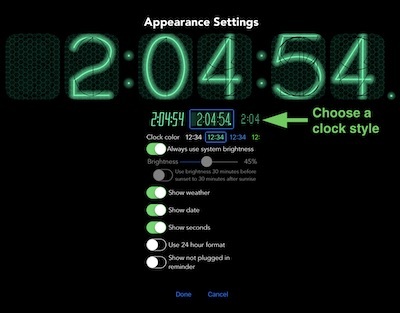 bnClock has three ways to display the clock: 7-segment (the default), Nixie, and text. 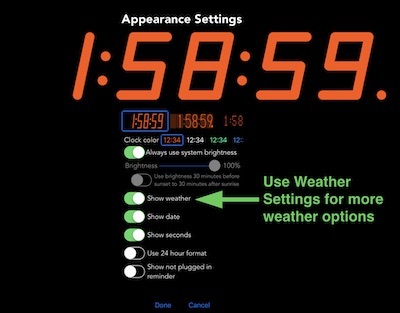 bnClock will display a weather forecast for your current, or a selected, location. This display can be disabled if desired. Use the switch next to the "Show weather for" to enable or disable the weather display. Use the Weather Settings to specify a location. You can turn off the warning that occurs when you start using bnClock and your device is not plugged in. However, this is not recommended because bnClock prevents your device from turning itself off while it is running. If you device is not plugged it, your battery could completely run down while you are sleeping.